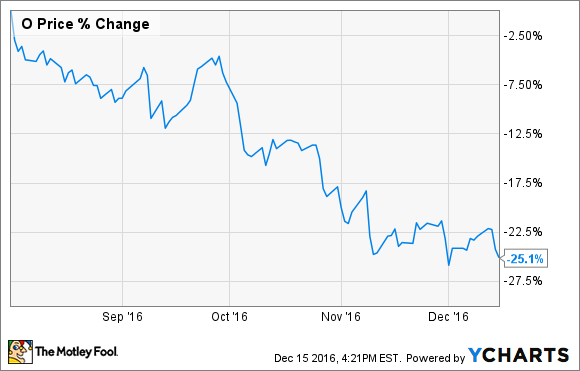 Will Realty Income Corporation Raise Its Dividend in 2017? Realty Income will raise its dividend in 2017 but not just once. I won't keep you in suspense. Yes, Realty Income (NYSE:O) will definitely raise its dividend in 2017. In fact, the company has already declared a small increase in its monthly payout, set to take effect with the January distribution. However, there's more to the story than that. Realty Income tends to increase its dividend several times every year, and 2017 should be no exception. The vast majority of dividend growth stocks pay a quarterly dividend payment and increase the payout (at most) once per year. Realty Income operates a bit differently. The company prides itself on its monthly dividend payments, as well as its tendency to increase its dividend four times per year. As of Jan. 2017, Realty Income will have made 558 consecutive dividend payments, and will have increased the amount of the payment 89 times since the company's NYSE listing in 1994. Over the years, Realty Income has increased its dividend at an average rate of 4.6% per year, and has produced total returns (dividends plus share price appreciation) averaging 17.9% annually. To put this in perspective, let's say that you invested $10,000 in Realty Income in 1994. Assuming you reinvested all your dividends, your investment would be worth about $374,000 today. Even better, you'd be generating $16,800 in annual dividend income -- more than you paid for your shares in the first place. Can Realty Income handle a higher dividend payment? For REITs like Realty Income, "earnings per share" isn't the best metric to gauge the ability to pay dividends. Instead, the number you want to look at is funds from operations, or FFO. You can read an in-depth look here, but for now, the important thing to know is that it's the most accurate picture of a REIT's income. As of the Jan. 2017 dividend increase, Realty Income will be paying dividends at an annualized rate of $2.43 per share. According to the company's third-quarter press release, Realty Income's full-year adjusted FFO guidance for 2016 is a range of $2.87 to $2.89 per share. Based on the midpoint of this range, this means that Realty Income could pay its dividend and have a cushion of $0.45 per share. So, the short answer is "yes" -- Realty Income could reasonably and comfortably increase its dividend further in 2017. Why has the stock price dropped? The real estate sector has not performed well lately, and Realty Income is no exception. In fact, since peaking in August, Realty Income's share price has dropped by more than 25%. This has absolutely nothing to do with the health of Realty Income's business. Rather, the main reason for the price drop is the market's expectation of higher interest rates in the years ahead, which was recently validated by the Federal Reserve's Dec. 2016 decision to raise rates by a quarter-point. Higher interest rates obviously make it more expensive for REITs to borrow money to acquire properties and also create selling pressure on the stock as investors expect higher yields. Think of it this way -- if the 10-year Treasury bond pays 2% and a REIT pays 4%, the REIT may entice an income-seeking investor to take on the additional risk. On the other hand, if the 10-year Treasury pays 4%, the REIT will need to pay a higher yield as well in order to keep investors buying. And dividend yields go up when prices go down. The point is, don't take the recent price drop as a sign of danger for Realty Income. The business is doing just fine, and there's no reason to believe the streak of dividend increases will be in jeopardy anytime soon.